Ladies & Gentleman ... wanna win a copy of Ant-Man & The Wasp on Blu-ray?! Of course you do, so take a minute out of your day and check out how to do just that! Moviegoers are still buzzing about Marvel Studios’ 'Ant-Man and The Wasp,' the follow-up to 2015’s 'Ant-Man' and the 20th consecutive Marvel Cinematic Universe film to debut at No. 1 opening weekend and ranked in the box office top 10 for six consecutive weeks this summer. On Oct. 2, fans can instantly watch the laugh-out-loud super hero adventure Digitally in HD and 4K Ultra HD™, and on Movies Anywhere; and on Oct. 16, take it home on Blu-ray™ and Blu-ray 4K Ultra HD™. Featurette's spotlight Paul Rudd, who returns as good-hearted thief turned hero, Scott Lang, and delivers big laughs both on set and in theaters; Evangeline Lilly, who transforms into The Wasp, the first female character to be featured in the title treatment of a Marvel Studios film; and iconic actors Michael Douglas and Michelle Pfeiffer as super couple Hank and Janet Van Dyne. Viewers can explore more about the visual development artists and effects used to bring the characters to life and drastically alter the size of the Super Heroes and their surroundings. Additional extras include deleted scenes, bloopers, outtakes, and audio commentary by 'Ant-Man' franchise director Peyton Reed. 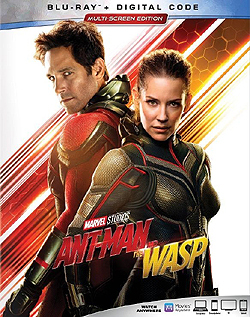 Enter today to win a Ant-Man & The Wasp on Blu-ray by simply answering the following question about one of the stars, Paul Rudd: Rudd spent three months studying Jacobean drama at the British American Drama Academy based in Oxford, England and whilst there attending acting school, he worked as a ... what?! Just fill out the form below and if you're one of the lucky ones chosen with the correct answer by January 15th, 2019, you'll win yourself a Ant-Man & The Wasp on Blu-ray! If YOU could change anything about ExclusiveMagazine.com, what would it be?! If you have something nice to say about Exclusive Magazine please do so and we'll print it (along with your name) on one of our pages!